I enjoy books. Recently, I've assisted people in getting their own titles into print. One, Acupuncture: The New Practitioner's Companion by John Hamwee may be found at Amazon.com. More recently, my wife and her sister and brother wanted to create a book containing the writings of their father — monthly pieces he has been sending us and our kids for some 15 years. 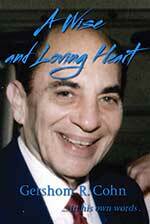 A Wise and Loving Heart — Gersh Cohn In His Own Words. This book is available direct and also from amazon.com. 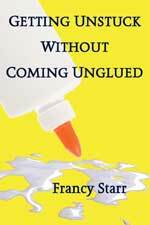 Proceeds from the sale of Gersh's book will be donated to the Jewish Housing Council in Sarasota, FL. 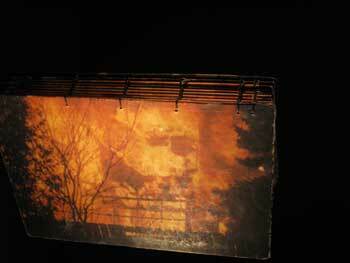 A favorite way of working for me is in the creation of 6" x 9" or 9" x 12" artist's books. Mostly with blank pages, plus a poem or two, with a hand-sewn binding. These books lay flat and have any number of uses. Please contact me to learn more or to talk about what you would like to have for your very own. 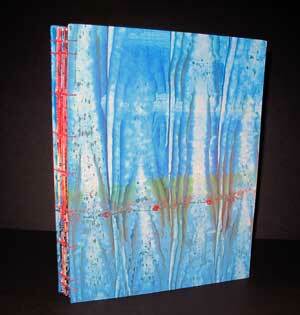 This 9 x 12" book was made in 2006 using handmade paste paper. The binding is hand-stitched and the inside pages blank. This was made as a personal journal after friends lost their home to a devastating fire. Howard Evans has worked as a creative artist, in one way or another, since about 1970. He was mostly self-taught as a potter and ran Studio 222 in Baltimore for 7 years. Now he createsone-of-a-kind books, mostly for friends and allies.